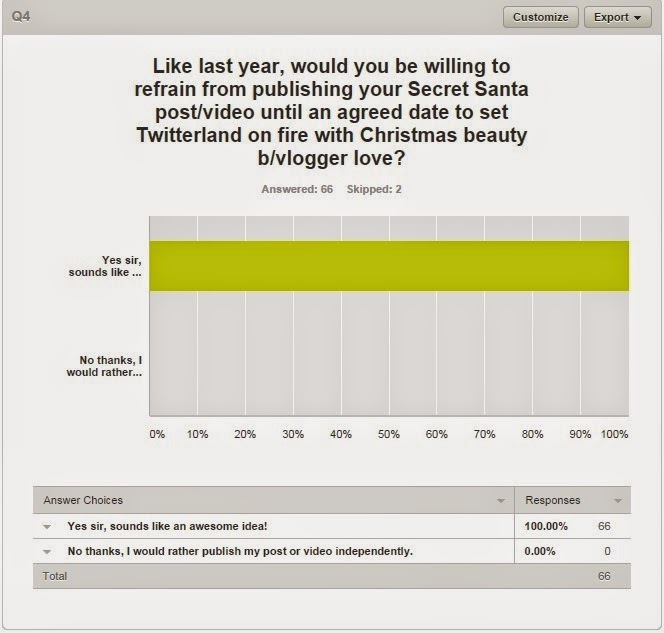 Irish Bloggers Secret Santa Extravaganza 2014- the results are in! 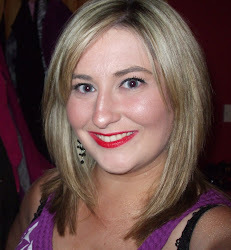 (I didn't half feel like Dermot O'Leary typing the title of this post!) 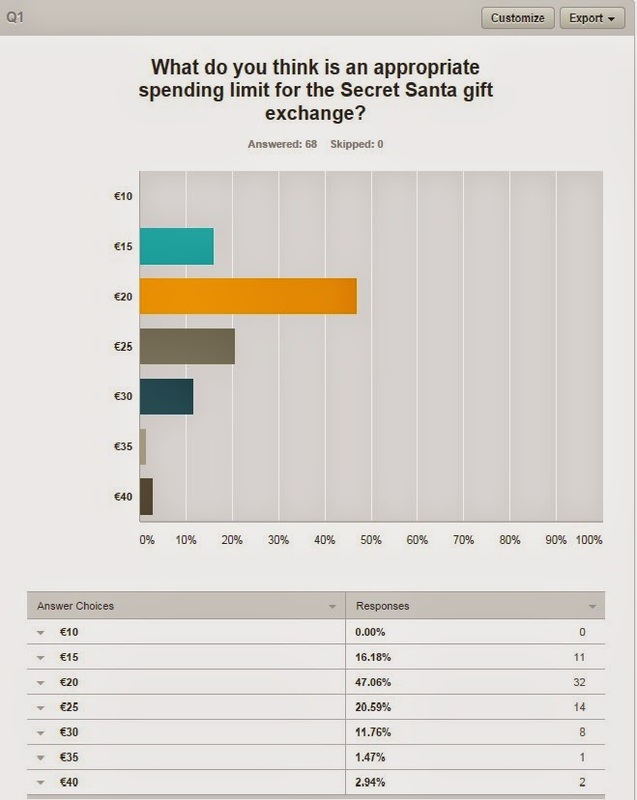 I put my proposition to the people and the people voted- 68 of you lovely people have cast your votes and I am now armed with all the details that you need for our annual Secret Santa Extravaganza! Again this year, there has been so much interest in this initiative which is absolutely awesome to see, and it just goes to show what a great community spirit there is amongst us Irish Beauty, Lifestyle and Fashion Bloggers and Vloggers! Whether you are a long time blogger or if you are just new on the scene, this is a brilliant way to be involved in something, befriend new people, pick out a surprise present for someone you may or may not know AND have a mystery present delivered to you! Winning! 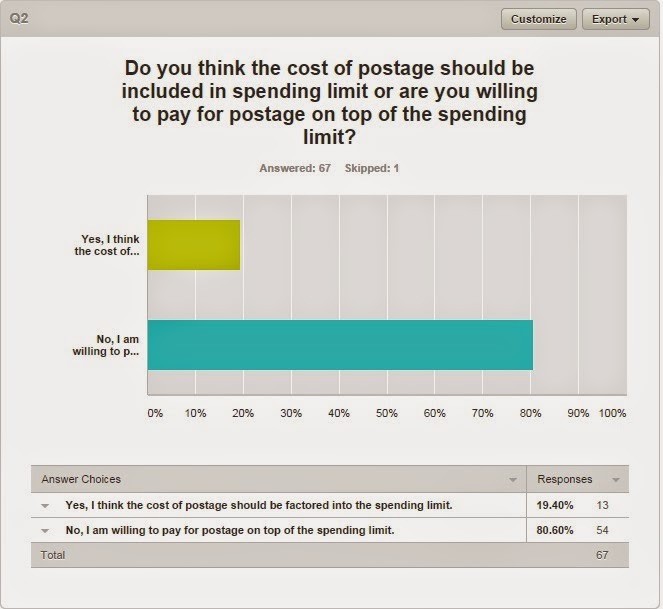 So there you have it- the spending limit with 47% of the public vote is €20. Spend €21 or €22 if you have to, but you have enough time now to browse online and in the shops to get great bang for your buck. 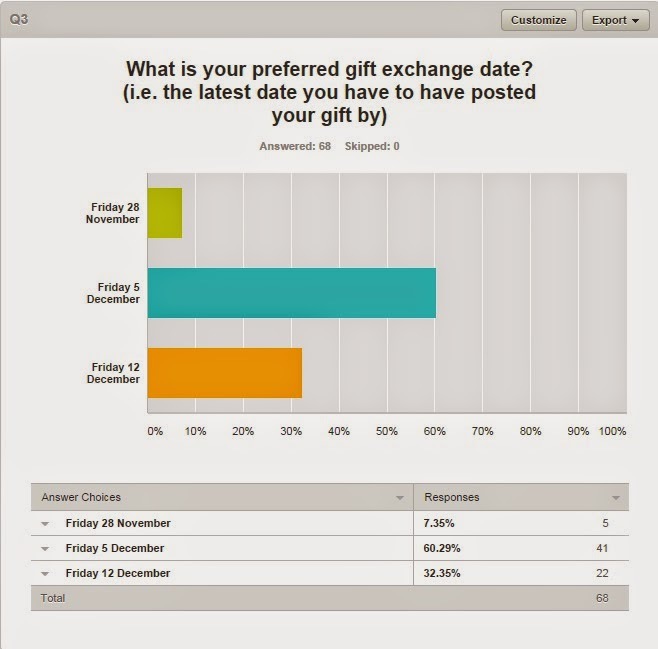 Over half of you have chosen Friday 5 December as the latest date you have to have sent your present by. Please stick to this as last year emotions ran high when presents were temporarily kidnapped by An Post in the Christmas rush. It should not take five days for a present to arrive from one address in Ireland to another address in Ireland, even with the Christmas rush, so if you have not received your gift by 12 December, please let me know so I can make the necessary secret enquiries to make sure all is running to plan. I am DELIGHTED that the 66 of you who cast your votes on this poll unanimously agreed to hold off on posting your present reveal until a specified date. You can of course prepare your post when you get the present in advance and schedule the post, but we must all endeavour to preserve the mystery and intrigue. Without further ado, the date of the BIG REVEAL is SUNDAY 21 DECEMBER. Put that in your calendars guys and gals, and don't worry, I will remind you of this date probably three thousand times between now and reveal day! 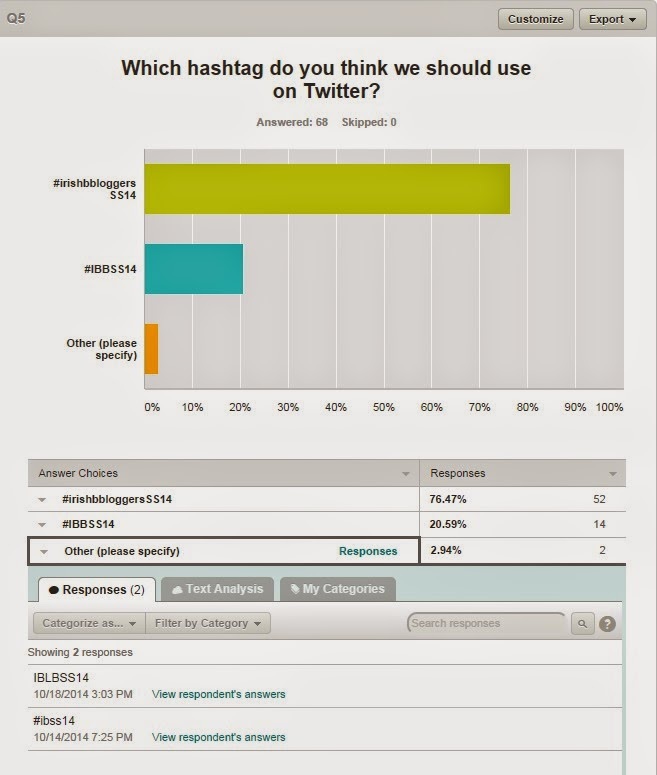 76% of you have chosen the hashtag #irishbbloggersSS14. Think "irish b bloggers Secret Santa 2014" as you write it to make sure you capture it all and that we can all find, retweet, favourite and reply to your tweets! And guys, please engage with Twitter! Don't let the person you're picking a present for cop on that you are their Secret Santa, but feel free to use the hashtag to post spoiler pics, to post hints, clues or inspirational pics, let us know you have signed up, if you want to help each other out with gift inspiration, if you want to let everyone know that you have posted your gift, and if you want to let everyone know you have received your gift, spread the love and work away. I want to encourage you all to tweet, retweet and favourite as many tweets as you possibly can and embrace the Christmas warmth ahead of the festive season. Most importantly of all- make sure that it remains a secret until the day of the big reveal. Last year, this was a roaring success, and I was so so so impressed by how everybody kept schtum about who they were shopping for! 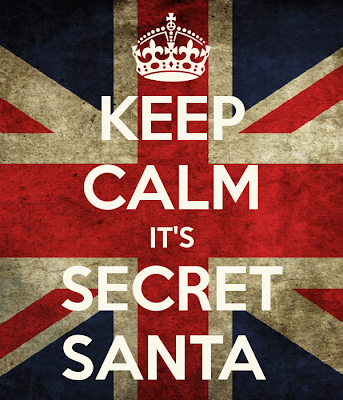 (hehe) Some people did not even find out who their Secret Santa was until the day of the big reveal!!! It was hilarious, everybody suspected everybody else, the shifty and suspicious looks were a-plenty. So, what you need to do now that you have the information is email me at totalmakeupaddict@gmail.com with your name and preferred postal address- be it home, work, your grandmother's house, your fella's gaff, wherever is handiest for you. I will use my very sophisticated "pulling pieces of paper with names on from a hat method" to match everybody up. I will be taking names up until 31st October. On 1st November, you will get an email from me which will have your person's name and address in it. Simples! I'll be on hand at any point to answer any questions or queries you have so don't be afraid to ask- you can catch me on Facebook, Twitter or by email. You might also send links to your blogs/channels so I can send them along with your names and address to your Secret Santa so they can use the information to get an idea of what you like (just in case you didn't already know!!) and to link your blog/channel in their post. Again, this is open to all Irish beauty/lifestyle/fashion bloggers/vloggers so get your blogging friends on board, spread the word and spread the love! Can we get more than 37 lovely bloggers to swap presents this year?